Various sized designs, sheet measures 12" by 17"
If your home doesn't look like the scene of a murder on Halloween, then you've been doing this 'decorating' thing all wrong. Oh yes, of course you could be worried about the amount of decorations and the clean up and all of that nonsense, but let's focus on the real issue here. 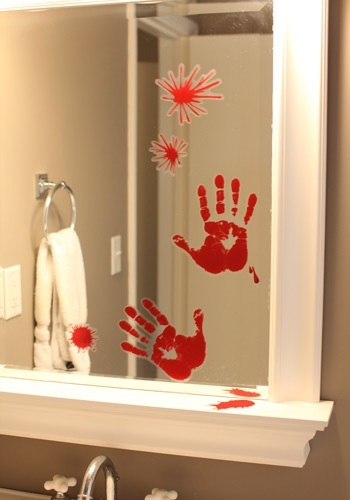 Making your home look like a murder scene should be convenient. Blood and blood substitutes can be difficult to come by and difficult to clean. However, if your residence is going to have the proper murder-y vibe, you'll need something bloody. Luckily, we can help you out. Our Bloody Handprint window cling set looks great on not just windows, but mirrors and other similar surfaces. And by great, we mean really, really bloody. There's 20 pieces and they're super convenient. There's no sterilization, clean-up, or any of that nonsense. You get to just peel and stick the gore on. How fantastic is that?